Simple dinner recipes are a busy mom’s best friend. When you’re strapped for time, you want meals that are easy to prepare, yet still delicious. On nights like these, less is always more. But, did you know there are actually many great recipes you can make on the grill? In fact, they’re often the easiest and the tastiest. So, skip the stove tonight and discover a few family-friendly dinner recipes on the grill. A favorite among kids, soda can chicken is a fun, delicious meal to experiment with on your Weber grill. It’s true that you can never go wrong with chicken, especially when it’s packed with flavor. The best part? It only takes about 15 minutes to prepare. Simply create a paste for the chicken using lemon zest, lemon juice, sage, oregano, brown sugar, cayenne pepper, and a can of lemon-lime soda. Some special equipment that you’ll need for grilling is hickory wood chips and an instant-read thermometer. 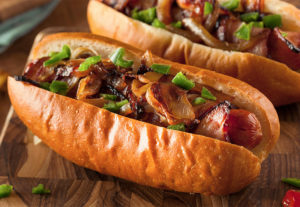 Change up your ordinary burgers and dogs with this bacon-wrapped hot dogs recipe. Hot dogs always taste best with the smoky flavor of a grill. To make this quick and easy dinner, start by slicing the hot dogs lengthwise. Tuck a piece of cheese into each wedge. Then, wrap one piece of bacon around each hot dog. Using a Traeger grill, set the temperature to 350°F and cook for approximately 20 to 30 minutes. Everyone loves the comforting flavor of grilled cheese. And, when you add BBQ brisket on top, it tastes even better. The recipe calls for two slices of Texas toast, two slices of American cheese and one tablespoon of room temperature butter. Prepare grilled cheese as you normally would by buttering each slice of bread. Don’t forget to add the brisket. Then, simply close the grill lid and let it cook for 10 minutes. Flip it over halfway through. If your family loves seafood, whip up some delicious shrimp tacos for dinner tonight. Start by skewering the shrimp, then coat it with olive oil and your seasoning of choice. With a Big Green Egg charcoal grill set for direct cooking at 400°F, place the shrimp on the grill for three minutes on each side. Finally, place the shrimp on flour or corn tortillas with your favorite toppings like coleslaw, pico de gallo, and avocado. Nothing hits the spot quite like grilled pepperoni pizza. It’s always a crowd pleaser for kids and their friends. Plus, homemade pizza always tastes better than takeout. This recipe, which works best with Traeger grills, calls for about 20 minutes of prep time. Keep in mind, you can prepare the dough the night before so that it’s ready for dinner the next day. Then, you’ll just need to prepare the tomato sauce before topping off the pizza with some cheese and pepperoni. Finally, slide the pizza onto a baking stone in the grill and wait for the crust to turn golden brown. With so many quick and tasty dinner recipes to try, what will you grill next? If you don’t have a grill, stop by Cape Ace Hardware in the Cape St. Claire Plaza. We carry a variety of gas, pellet, charcoal and electric grills from top brands. You can also find all your fuel, smoking chips and grilling accessories here, too.